When Gboard was released on iOS in May of 2016, it gave iPhone users more control over their mobile keyboard experience. Unlike the stock Apple keyboard, Gboard lets you customize the look of your keyboard and search Google directly from the keyboard itself. Now, Google has added even more functionality, by providing users with Google Maps, YouTube, and doodling support — all without leaving your chat. Google announced and released the update today, and the new features seem like a welcome change. 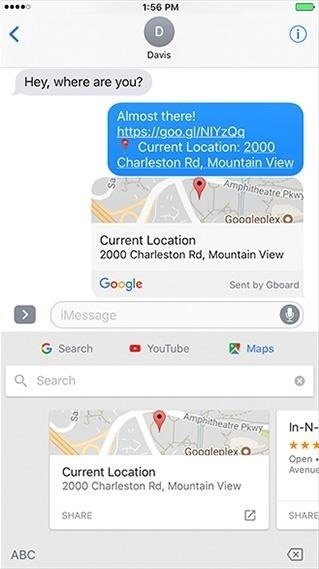 Google showed off how you can send a current location with Google Maps directly in chat, as well as any other place you wish. It's similar to what you can already do on iOS with the "Share My Location" or "Send My Current Location" features. However, you are limited to your current location that way. 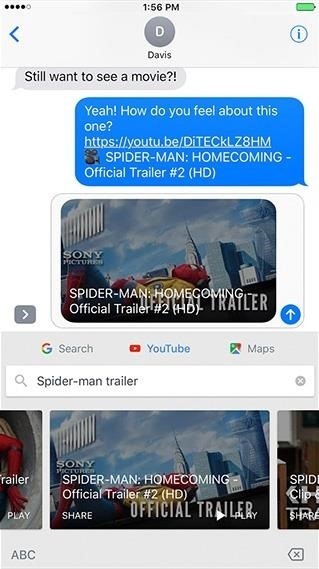 You can also now send YouTube video directly in a message. I never really knew I wanted this feature until now. Who knew how much fun it would be to spam my friends with 10 hours of SpongeBob saying "Yeah!" Finally, Google unveiled doodles, which allows users to — you guessed it — doodle to their friends. 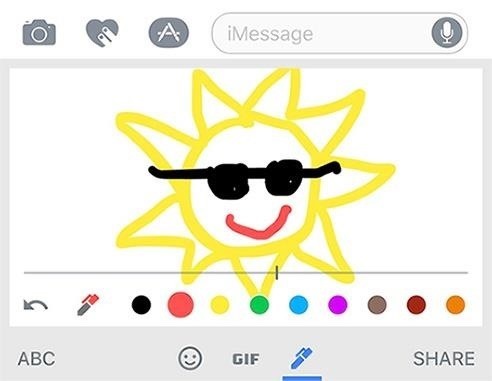 It looks fun and allows you to be a little more creative than the drawing tool Apple provides in its keyboards. To access the doodles feature, tap the emoji button while in Gboard, then tap the pen icon. Arabic, Hebrew, and Farsi are now supported in Gboard, which, while at the tail end of Google's press release, is a pretty cool feature. The more supported languages, the better — let's get talking! To try out Gboard for yourself, just tap here to install it, then add it as a keyboard in your Settings app.